Super Bowl 2017, like any of the really large, international events, fills the host city with a dizzying array of private parties, AirBNB reservations and car rentals. For a week during February, 2017, all eyes were on Houston for the Patriots vs the Falcons national showdown (with Lady Gaga at halftime). 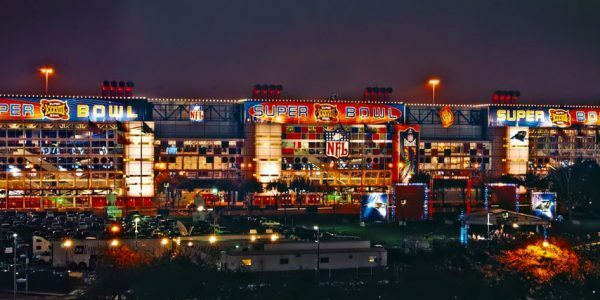 Of course, lots of private events means an increased need for super bowl event production elements like staging, rooftops, lighting, and electrical rentals. As the marketing companies descended on Houston along with the attendees, the production crew got ready for a week’s worth of event services! It turned out to be a pretty hectic week! Traffic in a grid-locked Houston affected event times. Security was tight, which affected truck delivery schedules with constant X-Ray scans at high security venues. However, our warehouse staff in Houston made switching trucks and gear seamless. Our expert techs worked together to handle over a dozen client events through the week. All of the staff had the opportunity to work with client names like Comedy Central, DirectTV, MKTG and Nike – all in one weekend! We would like to thank our clients and vendors for making our portion of Super Bowl 2017 a huge success. We’ll have several other busy weekends in 2017 coming soon. After all, SXSW is fast approaching. And large holidays like Cinco de Mayo, Fourth of July and Fiestas Patrias will keep our staff hopping. We look forward to working with both new and existing clients this year. In the meantime, view the list below to see all the shows at Super Bowl 2017 that we helped make successful! 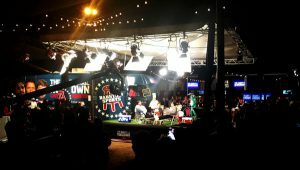 The second show for our old friends at ManHouse consisted of taking over the outdoor space at Kirby Ice House for a week and doing live broadcasts of Comedy Central’s new show, “The Barstool Rundown”. 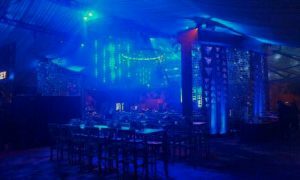 In Depth Events staff built the stage as well as a rooftop for lighting and protection. Our work on this show earned us a 5-star rating from our client! Our first crews in Houston began Super Bowl week with the staging and carpet bones for the DirecTV setup inside the George R. Brown Convention Center in downtown Houston. A last-minute pickup of 3,000 square foot of silver carpet rounded out the two main 24 foot x 24 foot stages and ADA ramps for this booth. There was nothing more exciting than a 24 foot X 24 foot stage in this booth. Other companies provided the lighting, audio and trussing for this booth. But the stage was there first! One of the many host hotels of the NFL needing lighting techs for setup, changeovers, and finally, strike. Our second show with this prestigious event company out of LA was called “Lot 97”. In initial conversations, Angel City couldn’t even disclose the end client for security concerns. As a result, the site of this location was the identifier for the show – even after we found out who the end client was. 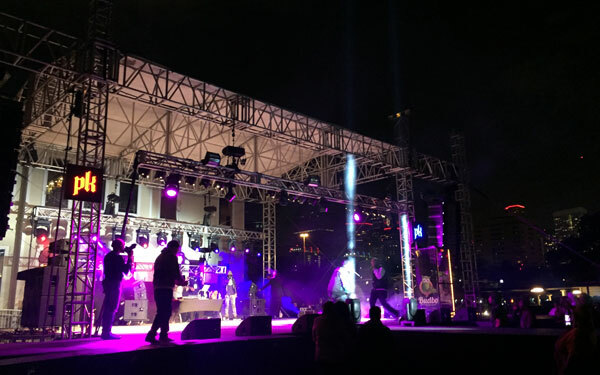 We provided a custom 24 foot half round stage as well as regular staging. We also provided a small army of lighting technicians for setup, changeovers and strike. This four day party ended with a bomb threat. 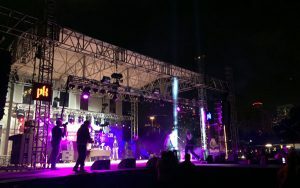 But still, we provided the stage, rooftop, lighting and generators for this outdoor event. On Saturday night, someone called in a bomb threat to the police. When SWAT and police showed up, they evacuated the event space. Luckily, the threat was a fake, but it still had devastating effects on the party. 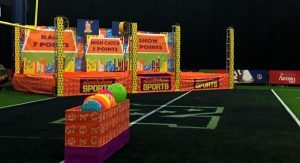 Another broadcast event with trussing, staging, labor, and special effects for this wacky taping of a Nickelodeon game show inside the George R Brown Convention Center. This outdoor event was held at a local event center. Nike came in to play with a revamp of the football field, portable bleachers, food vendors, and all the other aspects of a “Friday Night Lights” event. We provided generators and electrical distribution, making sure that all vendors had electrical power. Not all shows on Super Bowl weekend are Super Bowl shows! 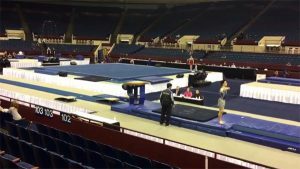 The Metroplex Challenge is an annual gymnastics event where we provide staging, audio and lighting. This 11 year repeat client began our week with a three day show at the Ft Worth Convention Center Arena. Check out a highlights video from the event here. Another event that just happened to fall on Super bowl weekend. This stage was for a corporate event. Hopefully this blog has been informative for our event planner clients! For more information on In Depth Events and our event production capabilities, please Ask Us a Question today. We look forward to hearing from you and working with you on your event!